Sherrinda, over at A Writer Wannabe, gave me the, "One Lovely Blog," award. Thanks, Sherrinda. Now, I'm supposed to choose 10 bloggers I enjoy. There are so many of you that it's difficult to decide. Hopefully, one of the following bloggers will add you to their list if you're not on here. 1. Christina Berry, Posting With Purpose - A blog about her writing journey and the faithfulness of God in her life. 2. Tiffany Colter, Writing Career Coach - Gives great tips and cheers us on to success. 3. Mary Ann Diorio, The Write Power - Practical and inspirational, this blog gets my brain and heart in gear. 4. Gail Gaymer Martin, Writing Right - A successful romance writer, Gail gives the benefit of her expertise. 5. Cindy Wilson - Shares her writing journey with all of us. 6. Crystal Laine Miller - First reader, contest judge, and all-around terrific person shares whatever's on her heart. 7. Terri Tiffany - I enjoy the interaction on Terri's blog. She has a way of creating a homey atmosphere and drawing the reader into the conversation. 8. Rita Gerlach, InSpire - Rita always piques my interest with tidbits I don't see anywhere else. 9. Pix-N-Pens - Tracy Ruckman, Debbie Roome, Suzanne Williams, and Kathy Ide delight us with a range of subjects from writing to photography. Each one has their own special style. 10. 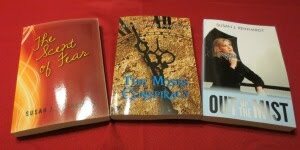 Gina Conroy, Writer...Interrupted - This is a group blog, focusing on the challenges of writing while raising a family. Their devotionals always touch my heart and encourage me to move forward. Thanks and congrats to the winners! 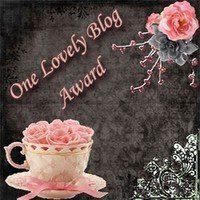 Susan,congratulations for winning the award for "One Lovely Blog"!!!! You do have a lovely blog and you always offer great content. Congrates!!! You totally deserve such an award. A lovely blog written by such a lovely lady! I love the links to the blogs you awarded. I am getting so many blogs to follow!!! So nice of you, Susan. Congratulations on the award! Your blog is definitely lovely :) And thanks for passing it on to me, that's so nice of you! That's one of the nice things about these awards. You find other great blogs and meet such nice people. Thanks for honoring me with this award. Thanks! BTW, I now have all the addresses. I'll be mailing out your book tomorrow (Thursday). Sherrinda is sooo right about you and your blog. Thanks so much and I'll pass it along as soon as I can! Anyway, you really touched me. Thank you, friend. I'm glad my short two-line description blessed you.